Spot resin trading was challenged this past week as negative sentiment has pushed buyers further away from the market. While overall Polyethylene and Polypropylene levels were only steady to weaker, we did see some consolidation and growing availability of both commodity resin groups at the lower end of their current price ranges. Fresh railcar offers flowed fairly freely and while some sold, it was more common to see the offers accumulate. The sharp discount between spot and contract Polyethylene prices should once again complicate producers’ efforts to implement their average $.03/lb increase in Nov. We expect Polypropylene contracts to decline in the vicinity of a dime, commensurate with the decrease seen in PGP monomer contracts. Weak crude oil markets, which are the key cost driver for international resin, continue to lean on Houston resin prices. Once again, the major energy markets were very volatile and closed sharply in opposite directions. For WTI Crude Oil futures, the most major movement came early in the week with a huge single day drop of $4.24/bbl occurring on Tuesday. The rest of the week saw small gains but did little to offset the losses; January WTI, the new front month futures contract, ended the week down $3.68/bbl to $56.68/bbl. Brent Oil saw similar action and ended the week down $3.42/bbl to $66.76/bbl. Nat Gas futures had massive swings this past week, it was the type of whipsaw trading that has not been seen in years. The Dec futures contract nearly reached $5/mmBtu in parabolic fashion before the market busted on Thursday, giving back a significant portion of the week’s gains. The Dec futures contract still settled at $4.272/mmBtu, scoring a sizable gain of $.553/mmBtu. After an extended period of mounting losses, the NGL market stabilized a week ago, and this week, both Ethane and Propane finally rebounded quite a bit, advancing around 10%. Ethane gained $.034/gal to $.35/gal ($.148/lb). Propane added $.07/gal to $.80/gal ($.226/lb). After several weeks of heightened activity, the pace of monomer trading subsided significantly. The spot Ethylene market was actually quiet, with limited trader interest and few visible transactions. 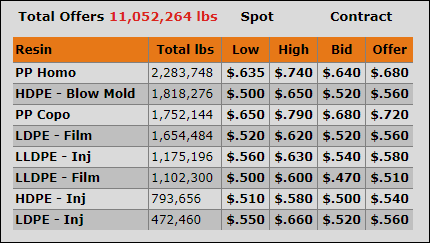 By Friday afternoon, November Ethylene had shaved off only a fraction of a cent, hovering just below $.20/lb. After enduring nearly a full month of losses, Propylene managed to garner a sliver of support in what was otherwise a lackluster trading week. 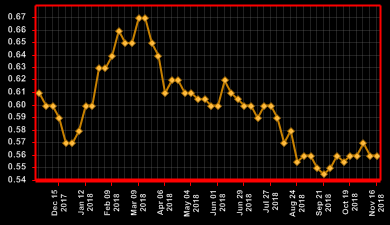 Spot PGP changed hands a couple times at $.46/lb and ticked slightly higher from there, but by Wednesday morning, bids disappeared and interest waned. The market finished the week near $.47/lb, recovering almost $.02/lb. 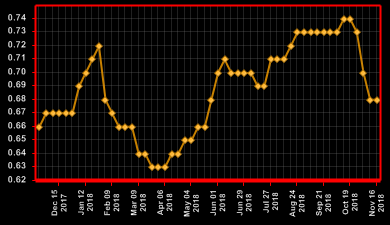 Nov PGP contracts began to settle at $.50/lb, down a full dime, which we feel is appropriate given spot levels. The spot Polyethylene market only trudged along this week; overall deal flow was noticeably subdued and our completed volumes fell below average. Spot prices were mostly steady to lower as resellers continued to sell off inventory and limit fresh purchases following their general desire to de-stock. As such, we have seen a recent trend of resellers securing spot truckloads vs full railcars for their customers’ needs in an effort to better time larger purchases as they anticipate cheaper resin ahead. The same can be said for processors opting to work off material on hand, cautious about replenishing their coffers. These savvy buyers seem to be positioning for special buying opportunities that often occur toward the end of the year. Although there is still an average $.03/lb PE price increase on the table, implementation seems very unlikely, as spot is well discounted to contracts and demand is soft. While PE producers have been stingy with domestic decreases, a growing number of market participants feel that contract price relief is warranted. With Crude Oil continuing to move lower while Natural Gas pushes higher, both in dramatic fashion, North American PE producers are in a rare tough spot as their margins are getting squeezed. If Nat Gas holds this higher level and NGLs recover further, domestic feedstock costs should rise while international Crude driven feedstock costs fall and resin export prices soften. PE export prices will sensibly need to drop in order to move large volumes of incremental resin, maintain the recent level of record exports and keep overly burdensome inventories from developing. Polypropylene trading was challenged this past week as buyers limit their purchases, even as prices fall. While overall PP prices were steady with a negative undertone, resin availability has improved as resellers sought to sell off their uncommitted warehoused material. We expect Nov PP contracts to follow PGP contracts down around $.10/lb, perhaps a tad less, as producers try to expand margins. While spot PP is weak, it has already been well discounted to contracts, and given the generally tight supply / demand dynamics, it might not see the same sharp declines as in contracts. Falling domestic PP prices have largely eliminated the import arbitrage and we anticipate a decrease in speculative imports and in turn, perhaps even tighter PP supplies come January.